These Chocolate Chunk Cookies are sweet and buttery with wonderfully crisp edges and yet their centers are soft and chewy. While I have called these cookies Chocolate "Chunk" Cookies, they are really a Chocolate Chip Cookie. The main difference is that I've added chunks of chocolate to the batter instead of regular chocolate chips. For the chocolate chunks, you can buy them or you can cut up your favorite dark chocolate bar (semi sweet or bittersweet) into small chunks. Of course, feel free to add chocolate chips instead of the chocolate chunks. Chocolate Chip Cookies are reported to be America's favorite cookie, and Ruth Wakefield's recipe has been the springboard for numerous adaptations. 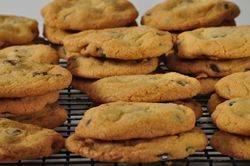 As a testament to how many recipes for this cookie exist, back in 1987 Chester Soling, owner of an Inn in Massachusetts, decided to sponsor a nationwide contest to find the best chocolate chip cookie recipe. Over 2,600 entries were received and the 100 best recipes were compiled in a book called "The Search for the Perfect Chocolate Chip Cookie" by Gwen Steege. This recipe is quite similar to the other Chocolate Chip Cookie recipe on the site. Besides the difference in using chocolate chunks instead of chocolate chips, I wanted to make these cookies larger, more like what is sold in bakeries. Now, if you want to make keep them small, by all means do so. The only thing you need to change is to bake them a few minutes less. You may notice that this Chocolate Chunk Cookie is leavened with baking soda. Two reasons for this. One is that it counteracts the acidity of the brown sugar, but it's also used as it aids in the browning of the cookies. Finally, for the chocolate chunks, you can use one type or a combination of bitter, semi sweet, milk, and/or even white chocolate chunks. You can even add some of those delicious toffee bits. Enjoy. Chocolate Chunk Cookies: Preheat your oven to 350 degrees F (180 degrees C). Line two baking sheets with parchment paper. In the bowl of your electric mixer (or with a hand mixer), beat the butter until smooth. Add the sugars and beat until light and fluffy. Scrape down the sides of the bowl as needed. Add the egg, egg yolk, and vanilla extract and beat until well combined. Add the flour mixture to the creamed mixture and beat just until incorporated. Stir or beat in the chocolate chunks. If the batter is quite soft, cover and refrigerate until firm (about 30-60 minutes). For large cookies, take about 1/4 cup (55 grams) of batter and form it into a round ball (can also use an ice cream scoop). Place six balls of batter on each baking sheet, spacing them several inches apart (about 8 cm). With the palm of your hand, gently flatten each ball into a round. Bake the cookies for about 14 - 16 minutes, or until they are golden brown around the edges but still a little soft in the center. (The longer you bake the cookies the more crispy they will be.) Rotate your baking sheet front to back about halfway through the baking time. Remove from oven and place on a cooling rack. Let the cookies cool for a few minutes on the baking sheet before transferring them to a wire rack to finish cooling.